These documents are available as PDF files - simply click on your choice of U.S. or Metric Units. Isolators can be modeled explicitly in analysis software such as ETABS, SAP2000 and LARSA. When software does not support an explicit isolator element, a spring element or a short column may be used to simulate the isolator. (Ke), yield force (Fy) and secondary stiffness (K2 or Kd). For response spectrum analysis the effective stiffness (Keff) and the equivalent viscous damping which is derived from the isolator's EDC (energy Dissipated per Cycle) are required. of the element description. An interesting characteristic of elastomeric isolators is that the compression stiffnes is about 100 times the tensile stiffness. Care must be taken in modeling the vertical stiffness to ensure the accuracy of the analytical results. 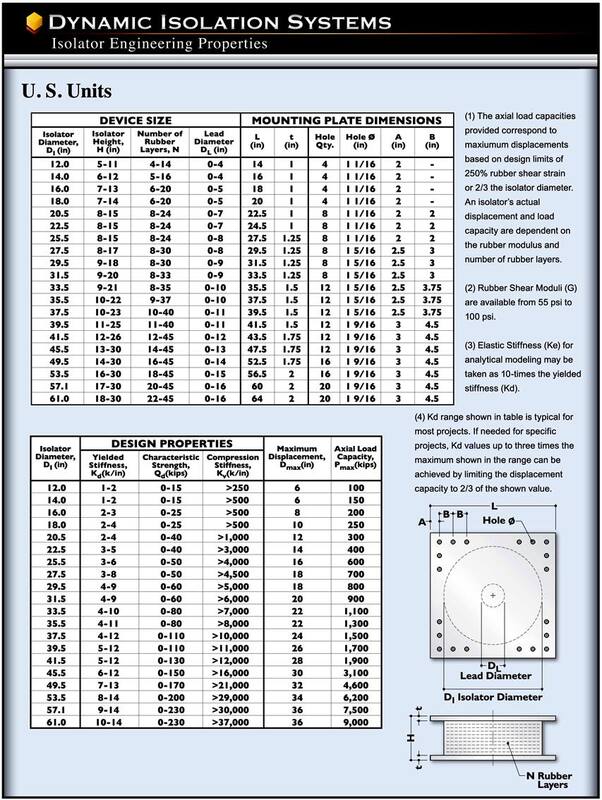 Typical values of these parameters for a wide range of DIS isolators are shown in the Isolator Properties Tables. The United States codes require testing on each project. Prototype tests validate the isolator properties over the range of the project's loads and displacements. Prototype testing may be eliminated due to similarity with previous projects. Production tests check the properties of isolators under the project's load and displacement conditions. by as much as three months. Isolators are tested in pairs at our plant and individually at laboratories such as the University of California, San Diego (UCSD). The test machine applies a shear dis- placement and axial load to the isolator. The loops shown plot the shear force and lateral displacement for the isolator and show the behavior of the isolator for a range of strains up to 300%. DIS has tested over 30 isolators at actual earthquake velocities of up to 60 inches per second. performance of our isolators under seismic conditions and provide detailed velocity data for the isolators. Over 500 high-velocity tests have been performed over the last ten years on isolators of up to 53.5 inches (1300mm) in diameter. 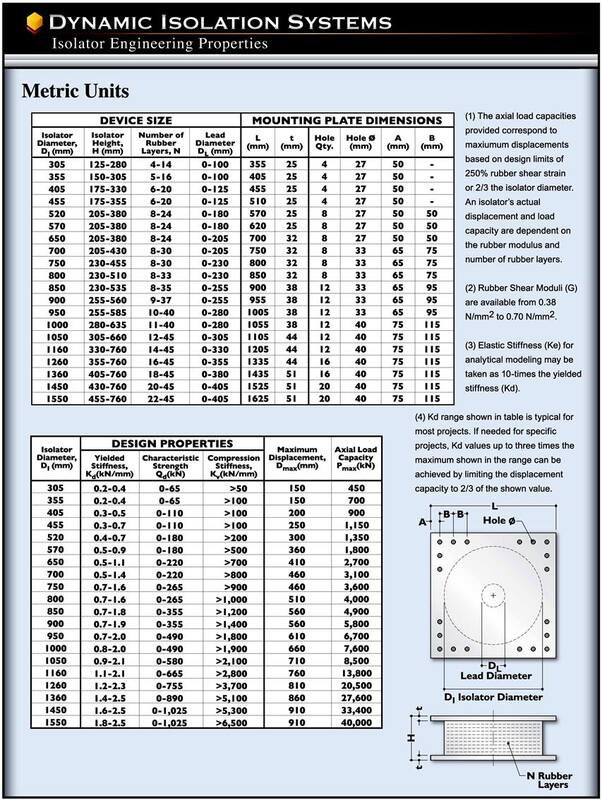 DIS has conducted extensive high-strain testing on isolators up to 53.5 inches (1300mm) in diameter. Isolators with and without lead cores have been successfully tested to over 400% shear strain. A one-mile (1.6 km) wear test was performed on DIS isolators at the NEES Lab, SUNY at Buffalo. The tests were conducted as part of prototype testing for the new Woodrow Wilson Bridge over the Potomac River in Maryland. This test simulated the effect of a lifetime of thermal expansions and contractions of the bridge deck. The results pictured here show that the isolator's properties were unchanged by this extreme testing. controlling the response to service loads such as wind. function of the modules, total height and area of the rubber. loop. This parameter relates to damping and isolator response to service loads. Keff (Effective Stiffness): This is the isolator force divided by the displacement. This is a displacement-dependent quantity. stiffness to the other, rather than a well-defined point. This value is mainly used in analytical modeling. Energy Dissipated per Cycle, EDC: This is the area of the hysteresis loop. This value is a measure if the damping of the isolator. Vertical Stiffness (Kv): This is the vertical stiffness of the isolator. DBE (Design Basis Earthquake): DBE represents the ground motion that has a 10% chance of being exceeded in 50 years. MCE (Maximum Considered Earthquake): MCE is defined as the ground motion that has a 2% probability of being exceeded in 50 years. What does shear strain refer to? The shear strain is the isolator lateral deformation divided by the rubber height. Design shear strains are up to 250%. DIS has tested isolators to more than 400% shear strain. At that strain, each layer of rubber is deformed laterally to four times its thickness. The extreme shear strains in research tests are a testament to the superior manufacturing processes and compounds developed by DIS and provide the isolator with reserve capacity. What are typical design displacements? (50 to 150mm). DIS has tested isolators to 47 inches of lateral displacement and provides isolators for all seismic zones worldwide. How is the period of the structure shifted? dominant frequencies of an earthquake are in the 0.2 to 0.6 second range. shift provided by isolation (See Diagram 1). How does added damping benefit the structure? damping in the 10 to 20% range. The building damping levels are optimized to provide low accelerations in the structure which maximize content protection. What is the difference of the lead core yield strength at creep loads and earthquake loads? values of lead stress resist service loads such as wind and braking. What is the design of the life of the bearings? day to one cycle in 12 seconds. The lead force at low velocity is 60% of that at high velocity. Does the structure re-center after an earthquake? to within a 1/4-inch of its original position. What is the response to the vertical component of an earthquake? can be accommodated in the design of columns and the isolators. Shake table tests have been conducted with and without the vertical component of the earthquake motion. The results indicate that there is very little difference in their performance of the isolators. Can a tall building be isolated? isolated period in the range of 4 to 6 seconds. The designers chose isolation for the better performance that it provides. Does the lead core fatigue? Lead is in its elasto-plastic phase at ambient temperature. As with other metals in this phase, lead re-crystallizes rapidly after being deformed without fatigue. Can an isolator resist tension forces? of the isolator and the rubber modulus. In general, tension is avoided in design. Can more than one bearing be use under a column? Multiple isolators have been used on San Francisco City Hall and the Tan Tzu Medical Center in Taiwan. Multiple isolators are used when they are more economical than one larger, single isolator. The bottom section of the elevator is suspended from the superstructure of the building. The framing cantilevers down and is not supported by the substructure. Alternately the plane of isolation can be lowered several feet locally to allow the elevator pit to be isolated as part of the superstructure. Stairways and access points are detailed to be fixed to the superstructure and be "simply supported" on the structure below the isolators. Small sliders are sometimes used to support stairs and accommodate lateral movements. How do utilities accommodate movement across the isolation plane in the buildings? Utilities that cross the seismic plane must be detailed to move horizontally. They often are made to be flexible or are fitted with universal joints (right). What are the fire protection requirements for base isolators? Out of more than 300 projects only three have required passive fire protection due to being in a space with a fire load. The need for fire protect-ion is determined by either the Fire Marshall or the Fire Engineer. Ninety-nine percent of our projects have not required fire protection as shown in this photo of The Berkeley Public Safety Building in California (left). In cases where fire protection was required the most cost-effective method was to use fire-rated board materials over metal framing (middle right). The cost of this type of fire-rated enclosure is in the cost range of a few hundred dollars. The joint between the two sections is sealed with a simple intumescent seal. Fire blankets (left) have also been used. DIS recommends the board-type solution as it is generally more economical and is installed by on-site carpenters as part of the regular framing work. Some isolation manufacturers have made claims that their product is "fire-rated". Such statements are not supported by any building code and would need to be proven by testing in accordance with ASTM E119. The code requires no rating of isolation systems in certain circumstances. Generally this is due to the absence of any fire load, as is typical in a basement. An isolator needs to be tested by a Nationally Recognized Testing Laboratory (NRTL) to determine its compliance with a code. (DIS's understanding is that no isolation product meets or can meet this requirement). A fire engineering assessment can rationalize or eliminate the need for fire protection. Holmes' full report can be found in the PDF attached to this link. We recommend that the Architect or the project's Fire Consultant review Holmes Fire's assessment of code compliance.